On February 8, 2017, about 1503 Alaska standard time (AST), a ski-equipped Piper PA-18-125 airplane, N1268A, sustained substantial damage when it impacted terrain while maneuvering about 4 miles southwest of Sterling, Alaska. The private pilot sustained serious injuries. The airplane was registered to and operated by the pilot under the provisions of Title 14 Code of Federal Regulations (CFR) Part 91. Visual meteorological conditions prevailed at the time of the accident, and no flight plan was filed for the personal flight, which originated from the pilot's private airstrip about 3 miles southwest of Sterling about 1445. 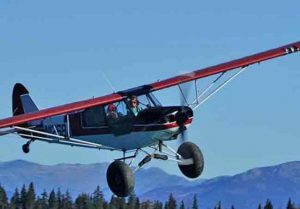 An Alaska State Trooper who responded to the site just after the accident stated that, when he arrived, the pilot told him the airplane became uncontrollable when the aileron control system locked in place as she turned the airplane to the right. Unable to roll the wings level, the airplane subsequently descended nose low and struck the surface of a frozen river. The pilot added she was unable to make aileron or elevator control inputs and was unable to "correct" by using rudder inputs. A Garmin Aera 500 GPS was recovered from the airplane and downloaded by an NTSB Investigator. The accident flight was recorded starting at 12:18:31 AST on February 8, 2017. Refer to the GPS Factual Report in the public docket for further flight track information. Family members of the pilot removed the wreckage from the accident site without permission of the NTSB and before an on-scene examination was performed. Photographs taken the day of the accident showed that the airplane impacted an area of snow-and ice-covered terrain on a river. The airplane came to rest in a near-vertical, nose-down attitude. The right wing exhibited spanwise twisting and was displaced about 30° aft of the airplane's lateral axis. The left wing displayed impact damage on the forward inboard section and wingtip and separation from the fuselage at the rear spar attachment points, and was displaced about 60° forward of the airplane's lateral axis. The propeller remained attached to the engine and exhibited aft bending and torsional twisting of both blades. The airplane was examined on the pilot's property on February 9 strapped to a trailer with several of its components separated and placed inside the airplane cabin. Both wings and the landing gear were removed, and the control cables for both wings were cut during the recovery operation. Control continuity was established for the rudder and elevator control systems. The aileron cables displayed continuity except for a right wing through-cable pulley, which was no longer located on the pulley track but was wedged between the pulley and attachment hardware. The pulley was sent to the NTSB Materials Laboratory for further examination; no evidence of unusual wear in the pulley or cable and no slack or loose connections in the pulley system was found. On February 8, 2017 about 1456 Alaska standard time, a ski-equipped Piper PA-18-125 airplane, N1268A, sustained substantial damage following a loss of control while maneuvering about four miles southwest of Sterling, Alaska. The solo private pilot sustained serious injuries. The flight was operated as a visual flight rules (VFR) personal flight under the provisions of 14 Code of Federal Regulations Part 91. Visual meteorological conditions (VMC) prevailed at the time of the accident, and no flight plan was filed. The flight originated from the pilot's homestead airstrip about three miles southwest of Sterling, Alaska. During a telephone conversation with the National Transportation Safety Board (NTSB) investigator-in-charge (IIC) on February 9, an Alaska state trooper that responded to the site just after the accident said that when he arrived on scene, the pilot told him that the airplane became uncontrollable when the aileron control system locked in place as she turned the airplane to the right. Unable to roll the wings level, the airplane subsequently descended nose low, and it struck the surface of a frozen river. The NTSB IIC, along with a second NTSB investigator, and two Federal Aviation Administration (FAA) airworthiness inspectors from the Juneau Flight Standards District Office, traveled to the accident site early in the morning of February 9. However, family members of the injured pilot removed the wreckage from the accident site before the NTSB could arrive on scene, and an NTSB postaccident wreckage examination was done after recovery. The airplane's flight control cables had been cut and compromised during recovery. The closest official weather observation station is located at the Soldotna airport, approximately 7 miles west of the accident site. At 1456, an Aviation Routine Weather Report (METAR) was reporting, and stated in part: Wind 290 degrees (true) at 4 knots; visibility 10 statute miles; clouds and sky condition, overcast at 2,300 feet ceiling; temperature 25 degrees F; dew point 10 degrees F; altimeter 29.84 inHg.